Manufacturer of exhaust gasket for deutz 628 from India. We export high quality replacement spare parts for Mitsubishi Canter from India. By understanding the altering demands and desires of our respected patrons, we are enthusiastically instrumental in offering a distinctive compilation of Exhaust Gaskets. We are one of the foremost firms of Exhaust System Gasket. Besides, we present this product at nominal rates to our customers. Conical exhaust gaskets are extremely important for emission control. 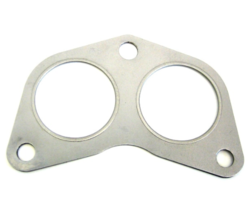 This Gasket is used for the crossover of exhaust manifold to the exhaust pipe. These are presently manufactured in various different combinations, keeping in view the OEMs specifications and requirements. We are a unique entity in the industry, actively committed towards offering the optimum quality range of Turbo Exhaust Gasket. Invicta is one of the world's largest manufacturers of gaskets for exhaust systems. Our gaskets are known to seal perefectly and accurately. Moreover, all our gaskets are manufactured using the latest machinery and technical expertise. We have gained recognition as an eminent enterprise, devotedly engaged in manufacturing, exporting and supplying a broad range of Exhaust Gasket. New Swan Autocomp. Pvt. Ltd.
We offer exhaust systems gaskets which is known for its effectual working among our distinguished clients. The production of hight quality of exhaust gaskets of various types - Exhaust Gaskets , spiral Gaskets, SS Wire mesh gaskets ring, Graphite and Non asbestos for all Types of Vehicle. We are leading manufacturer and supplier of Exhaust Gaskets. These products are manufactured by finest quality raw material. These gaskets are widely used in various automobile industries because of their better quality and flawless performance. Our range of includes a variety of metallic and non-metallic inlet and Exhaust manifold Gaskets in asbestos and non-asbestos material icludes-Rubberi sea cork, cellulose fiblre, compressed jointing sheets, speciality paper.